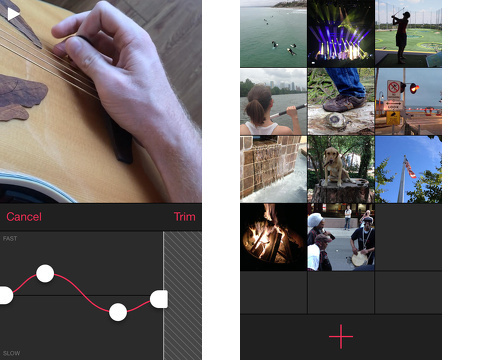 The Slow Fast Slow iPhone app manipulates the speed of your videos with slick interface and smart gesture controls. 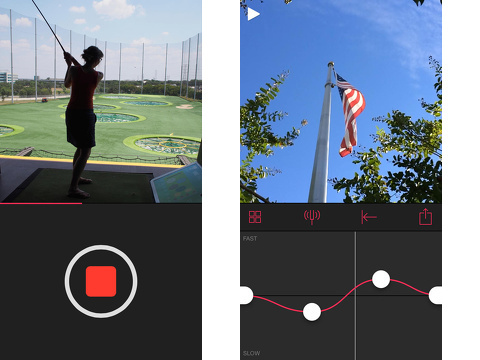 In an increasingly saturated market of do-it-all video iPhone apps, the Slow Fast Slow iPhone app sets itself apart by taking on one important video editing task and giving you the tools to execute it well. The $1.99 download from the iTunes App Store is a solid investment for video iPhone app junkies, Vine addicts, Tumblrs, and bloggers. The unexpected start to the Slow Fast Slow iPhone app is refreshing and complements its function as a singularly-focused tool. There are no social syncs or e-mail account set-ups. Yes, the only sharing feature is save to your iPhone camera roll. From your camera roll, you can manipulate the video and share at your whim without automatically generated hashtags and a mandatory participation in yet another social network. The home screen is a grey matrix with a black bar at the bottom. The only color on the screen is the fuschia plus icon. You touch the plus icon, and the in-app camera opens. A pop-up to request microphone access appears. Then, you touch the bright red start button on the screen and shoot your video. The time frame is short like the Vine iPhone app. The video editing screen is, again, simple and efficient. The video plays in the top portion of the screen. There is a menu bar with four icons – return to grid, turn volume on and off, reverse the film, and share – just below the video. The bottom third of the screen is a volume-style meter, but this one has a twist. The volume-style meter with two middle dots and two end dots is a gesture-controlled interface to trim the length of the film and manipulate the speed in specific increments. If you drag the dots at the edges of the screen towards the middle, then you trim the video to a preferred segment. These end dots and middle dots can also be pulled up and down to change the speed of the film. As you drag a white dot up, you create the point where the film speed increases. A dot placed in the lower part of the bar is the signal to change the film speed to slow. If you leave a dot on the middle line, then the normal film speed prevails. You can drag these dots horizontally to different times in the field, so they do not have to remain in a specific time mark in the video. These agile, accurate gesture controls create fluidity and texture. The transition between film speeds is subtle, so there is a seamless flow to the new speed. This carefully crafted transition between speeds and the smart gesture controls create an unexpected creative experience with the Slow Fast Slow iPhone app. AppSafari review of Slow Fast Slow was written by Jenni Ward on November 5th, 2013 and categorized under App Store, Photos, Utilities, Video. Page viewed 3701 times, 1 so far today. Need help on using these apps? Please read the Help Page.